Peanut oil is a mild flavored oil that is excellent for frying and is often used in Asian cuisines. Peanut oil is offered in several varieties and can be purchased at most major groceries stores. Peanut oil is used for frying, sautéing, and simply to add flavor. Although most varieties of peanut oil have a very light, neutral flavor, they can sometimes have a slightly nutty flavor. Roasted peanut oils are strongly flavored and are usually added after cooking for added flavor. Peanut oil is perfectly suited for frying because of its high smoke point. Peanut oil smokes at approximately 435 degrees Fahrenheit, which means that it can hold up to the high temperatures required for frying most foods. Peanut oil is also unique because it does not absorb flavors from the foods that are fried in it, meaning that multiple food types can be fried in the same batch of oil without cross contamination of flavors. For this reason, peanut oil has become a favorite in large-scale food operations where multiple food types are often cooked in a fryer before the oil is replaced. There are several varieties of peanut oil on the market today. From refined, 100 percent peanut oil to peanut oil blends, each has unique flavors and cooking properties. Refined Peanut Oil—This is the most common form of peanut oil used for cooking. This oil has been refined to remove flavors and colors, making it a completely neutral cooking oil. The refinement process also removes allergens, making it safe for those with peanut allergies. Virgin or Cold Pressed Peanut Oil—This peanut oil has not been refined and retains much of its natural flavors and aromas. Even virgin peanut oil has a light flavor and can be used without overpowering the flavors of other ingredients. Roasted Peanut Oil—Peanuts can be roasted prior to expelling their oil, which provides a deep nutty flavor and dark golden brown color. This oil is generally used for flavoring, rather than cooking. It can be drizzled over food after cooking or added to dressings, sauces, and marinades. Peanut Oil Blends—Peanut oil is sometimes blended with lower cost oils, such as soybean oil, to make them more affordable. It is usually blended with an oil that has a similarly high smoking point, to preserve it's excellent frying qualities. Unrefined peanut oil or roasted peanut oil may pose an allergenic danger. 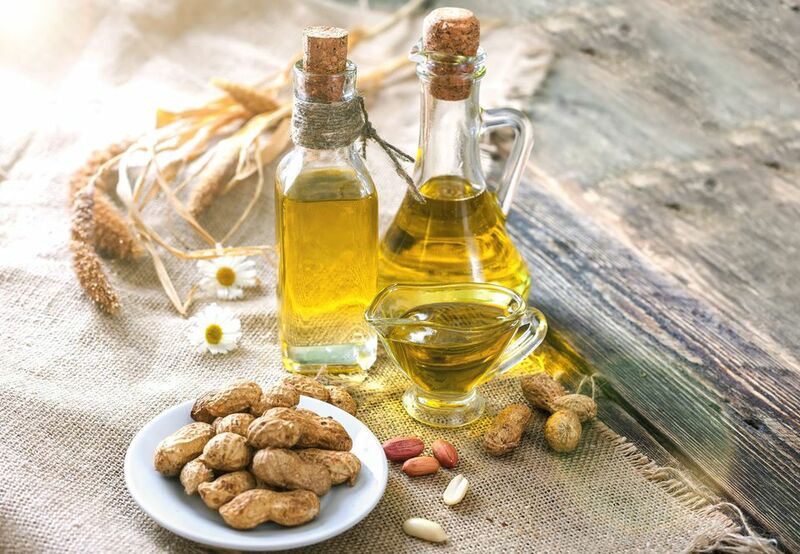 Peanut oils that are labeled as "refined," which includes the varieties most often used in food service operations, have had all of their allergenic compounds removed. According to the FDA Allergen Labeling and Consumer Protection Act of 2004, these refined oils can be excluded from being labeled as a "major food allergen." An unopened container of peanut oil will stay fresh for approximately one to two years. Be sure to store it in a cool, dark place to extend its lifespan. Peanut oil that has been used for frying can be stored and used again. Used peanut oil should be stored in an air-tight container in a cool, dark place, preferably refrigerated. Overheating peanut oil (past its smoke point) will considerably reduce its lifespan. Making sure that all food particles have been filtered out prior to storage will also help maintain its freshness. Once opened or used, peanut oil should be used within six months.